Almost every single element of 'The Social Network' is astounding. It is a near-flawless film, crafted by the exceptional dialogue of Aaron Sorkin and the consummate directing skill of David Fincher. I could leave it at that but this film deserves a proper review. 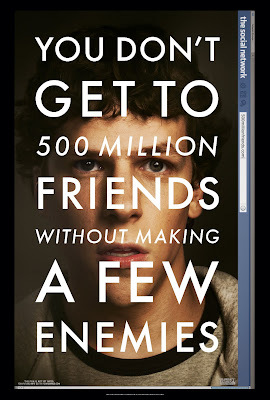 'The Social Network' charts the origin and gestation of Facebook.com at Harvard University. Facebook did not exist until 2004. It now has over half a billion members. Jesse Eisenberg plays the driving force behind the site, Mark Zuckerberg, the youngest billionaire ever. The film examines two simultaneous lawsuits from Zuckerberg's closest friend Eduardo Saverin (Andrew Garfield) and three other students also studying Harvard University, as each party stakes a claim to the founding of the website. Fincher seems quite happy to take slightly more of a back seat than usual as director and allow Sorkin's awe-inspiring dialogue to take hold. But Sorkin's words would count for little without the performances to carry them. He gets those performances throughout the cast. Jesse Eisenberg and Andrew Garfield are both supremely engaging, despite their contrasts. 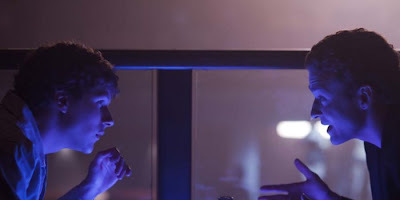 Even Justin Timberlake, who may initially appear to be the film's weak link, delivers such an unsympathetic performance as Napster co-founder and Facebook advisor Sean Parker, I genuinely would like to see him give this acting malarkey a proper go and drop the music entirely. Then there are the Winklevoss twins (who along with Divvya Narendra) are purported to have birthed the idea of the online social network, that eventually became Facebook. And so they sued Zuckerberg too. The performances are equally as brilliant as any of the other cast members but the truly unnerving fact here is that the brothers were actually played by one actor, Armie Hammer. I sense a possible visual effects Academy Award nomination, which will hopefully be just one of many - including recognition for Trent Reznor and Atticus Ross' arresting score. The main issue with any fictionalised film is just how much of the film is steeped in reality. While Zuckerberg never quite appears to be a super villain, Saverin is painted as too much of a victim and Sean Parker is perhaps too unfairly maligned. Certain other parts of the film are equally as liberal with the truth. There have also been claims of sexism tabled against Sorkin, with scenes of debauched women reminiscent to one of those ridiculous house parties in teen TV drama 'Skins' and the prominence of one particularly psychotic girlfriend. Yet one woman in the film rises above this - Erica Albright (Rooney Mara). She dumps Zuckerberg at the start of the film for insulting her supposed lowly status as a Boston student not studying at Harvard. Zuckerberg is driven by this action, almost rallying against the entire female population, while still retaining his sexual lust. Albright inadvertently becomes the catalyst for the creation of Facebook. Later, Albright's strength and authority in one poignant restaurant scene, which leaves Zuckerberg speechless for the first time, belies any overt notion of sexism from Sorkin. 'The Social Network' isn't the character assassination that it has been painted out to be, Well, unless your name is Sean Parker. Zuckerberg is portrayed as someone wrestling with his status in Harvard's overwhelming arena of exclusivity and elitism. The lack of a sense of entitlement and lack of monetary motivation set him aside from the other supposed founders. The irony of Facebook is that a man with questionable social skills went on to create the greatest online social network that exists today. However, 'The Social Network' isn't really about Facebook at all. It's about elitism. It's about ownership. It's about rebellion. But most (interestingly) of all, it's about Zuckerberg's relationships with the people closest to him. 'The Social Network' is in cinemas across the UK now. Download five free tracks from the film's score here.